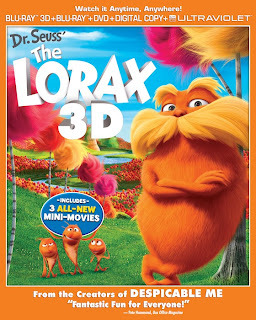 Dr. Seuss' The Lorax movie is arriving on Blu-ray 3D and 2D combo pack on August 7th. The story of the movie is based on the best-selling children's book by Dr. Seuss. The combo pack has three brand new mini-movies, making of the mini-movies, deleted scenes, the screening process, tutorial on how to draw the Lorax, Humming-fish and a Bar-ba-loot and many more. We enjoyed the colourful story. The references were cute and was fun to watch for children and adults. It is a thought provoking movie about saving our trees and how important trees are for breathing, fresh air and our environment. The movie is created by the same people as Despicable Me and Hop, so you know how good it is. Here is a synopsis of the story. The imaginative world of Dr. Seuss comes to life like never before in this visually spectacular adventure. Twelve-year old Ted will do anything to find a real live Truffula Tree to impress the girl of his dreams. When Ted embarks on his journey, he discovers the incredible story of the Lorax; a grumpy but charming creature who speaks for the trees and about what happened to all the trees. Boys and Girls club of America partners with EPA's Energy star on "The Lorax Pledge Drive" to help families save energy, money and make a difference to the environment. Top pledge drivers will get an Energy Star Samsung LED TV, a library of Universal movie titles and a trip to Universal Studios Hollywood. On Saturday August 4th from 9a.m. to 12p.m. all Home Depot stores in the US will have Lorax activity sheets, create-your-own moustache kits and sticker sheets at their Kids Workshop. Children age 5 to 12 years will be able to "Build a cork bulletin board", learn about tool safety, get a workshop apron, commemorative pin and certificate of achievement. Each store will have a life sized Lorax poster on the wall so you can take pictures of your children with Lorax. 3 more activities for children to do in anticipation of the upcoming Secret of the Wings movie :) Click on the button below to get the games and activities. We cannot wait to sit down as a family and enjoy the LORAX! We still haven't seen it! We were hoping to, but the movie theatre is 2 hrs away! Thanks for the great post! I can't wait to watch this with the kids! We haven't seen it yet. We took my kids to see the Lorax in the theater when it came out, and loved it! It's one we will be sure to own on dvd too. I am really excited about The Secret of the Wings too! My kids adore Tinkerbell!